Augie Doggie and Doggie Daddy are Hanna-Barbera cartoon characters who debuted on The Quick Draw McGraw Show and appeared in their own segment of that show. The segments centered around the misadventures of a dachshund father-and-son team. Doggie Daddy (voiced by Doug Young with a Brooklyn accent, based on a Jimmy Durante impersonation) tried to do the best he could at raising his rambunctious son Augie (voiced by Daws Butler). The characters have made appearances outside of their series, including in their own video game and in Yogi's Ark Lark and its spin-off series. The segments centered around the misadventures of a dachshund father-and-son team. 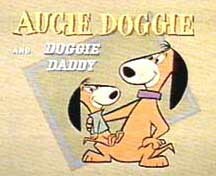 Doggie Daddy (voiced by Doug Young with an Brooklyn accent, based on a Jimmy Durante impersonation) tried to do the best he could at raising his rambunctious son Augie (voiced by Daws Butler). Augie, who loved his father, would often refer to him as "dear old Dad." Their mutual admiration included Daddy gently chiding, "Augie, my son, my son", when he would disappoint his father; and when his son would say or do something that inspired pride, Daddy would turn to the audience and say with a grin, "Dat's my boy who said dat!" The segments and characters were similar to the Spike and Tyke cartoons William Hanna and Joseph Barbera produced during their theatrical animation careers at Metro-Goldwyn-Mayer in the 1940s and 1950s. All of your troubles away. An instrumental version of the song was used as the introductory theme to each cartoon. Augie is a highly spirited pup who is motivated by ambition and the desire to make his father proud. He is typically seen wearing only a green shirt. Possessing some knowledge in science and the ability to converse with animals, Augie would often capitalize upon his father's foibles. The smooth-talking Doggie Daddy attempts to provide strict parental guidance to Augie, often to Augie's displeasure. Doggie Daddy is usually depicted wearing only a collar. Despite his strictness, Doggie Daddy has a warm personality and typically acquiesces to his son's wishes. Doug Young voiced Doggie Daddy as a Jimmy Durante impersonation. Tired of getting small toy foxes for his birthday every year, Doggie Daddy allows Augie to go into the woods for a real one. Augie is permitted by his father to guard their home for one night. Augie befriends a skunk, much to his father's dislike. An ant takes a beating from Doggie Daddy, then decides to assemble some troops to get back at him. Augie comes up with a flying saucer and heads into orbit. Augie wants to keep a horse at home but his father is reluctant. For unknown reasons, Augie won't speak to his father. A neighborhood child challenges Augie if his father ever starred on television. Doggie Daddy goes for it. Augie decides to live a life in the circus. His father then follows. Augie steals a sack of cash from a bank to pay his father's bills, or so Doggie Daddy thinks. Augie Doggie and Doggie Daddy exchange roles. Augie and his father go camping. The duo tries to get rid of an annoying mouse from their home. Doggie Daddy drinks a potion made by his son and starts to become airborne. Doggie Daddy teaches his son how to deal with a vicious cat. Augie invents a robot to be a servant to the household. Doggie Daddy applies another potion made by his son and shrinks. Because Augie's favorite hero wouldn't show up on his birthday, Doggie Daddy, in disguise, takes charge. A sly crow tricks the duo to providing him hospitality. An orphaned duck wishes to join the family. A baby alien is sent to be baby-sat by Augie. Three mosquitoes infiltrate the duo's home. Augie adopts a run-away circus lion. A wiley alley cat tries to get Augie's trained hummingbird before his "big TV appearance". A nutty woodpecker insists on staying at Augie's house, despite Doggie Daddy's objections. An ostrich hatches from an egg that rolls into the Doggie hen house and Augie decides to adopt it. The orphaned duck pays them a visit to their home. Augie tries to cure his friend, a sick mouse. However, a cat is on the loose and is eventually shrunk by Augie with his shrinking chemical. Augie creates a voracious plant that starts eating all the food. While Augie tries to find a giant that only exists in a fable, his father attempts to make it a reality through disguise. Fearing that he might lose his worth as a father, Doggie Daddy attempts to eliminate a bookworm from the library. Doggie Daddy acts as a sick patient to play along with his son; A cat bothers patient Doggie Daddy. While the duo are having a winter trip, they are greeted again by the orphaned duck. A lion (Snagglepuss) escapes from the zoo and acts as a rug in the two dogs' home. Doggie Daddy makes up stories about him being one of the musketeers just to impress his child. Doggie Daddy receives a horse for his birthday from Augie. Augie makes up an imaginary friend. Doggie Daddy plans to make a real genius out of his son. Augie and a British parrot go treasure hunting. Augie befriends a gorilla and tries to keep it indoors. Augie starts to go on a journey on his own to prove to his dad that he's grown up. Augie gets his hands on a money-counterfeiting machine. The owner attempts to get it back from him. Augie puts on a circus act for a request by the owner so he can get the money since Augie hid it. Doggie Daddy gives pointers to Augie on how to impress the guests at the party next door. Doggie Daddy wants Bigelow Mouse to leave the house, but he refuses. Augie and Doggie Daddy goes on a hunting trip to Mars, encountering a wacky Martian "rabbit". Augie Doggie and Doggie Daddy appeared in Yogi's Ark Lark, its spin-off series Yogi's Gang, Laff-A-Lympics, and Yogi's Treasure Hunt. John Stephenson voiced Doggie Daddy in those appearances since Doug Young was first caring for his ailing wife at the time. They also appeared in Casper's First Christmas, Yogi's First Christmas, Yogi Bear's All Star Comedy Christmas Caper, and Yogi Bear and the Magical Flight of the Spruce Goose. Augie Doggie and Doggie Daddy appeared in the "Fender Bender 500" segment of Wake, Rattle, and Roll. They drive a doghouse modeled monster truck called the Lucky Trucky. In Yo Yogi!, Doggie Daddy was referred to as "Diamond" Doggie Daddy where he owned Jellystone Mall and Augie was his heir. In those appearances, John Stephenson still voiced Doggie Daddy while Augie was voiced by Patric Zimmerman. Doggie Daddy made a cameo appearance on Family Guy, Season 9, Episode 17, "Brothers & Sisters" broadcast on April 17, 2011, in which he played the third husband of Lois' sister Carol. Augie Doggie also made a cameo appearance in an episode[clarification needed] of Ni Hao, Kai-lan. Augie Doggie and Doggie Daddy also made a cameo in Flash Toons called "Law and Doggie". Augie Doggie and Doggie Daddy also made a cameo appearance in a 2012 MetLife commercial entitled "Everyone". Augie Doggie and Doggie Daddy appeared in Harvey Birdman, Attorney at Law. Augie was voiced by Chris Edgerly and Doggie Daddy was voiced by Maurice LaMarche. Augie Doggie and Doggie Daddy appeared in DC Comics The Snagglepuss Chronicles. A video game featuring and named for the characters was released in 1991 for the Commodore 64. ^ a b Mansour, David (2011). From Abba to Zoom: A Pop Culture Encyclopedia of the Late 20th Century. Andrews McMeel Publishing. p. 16. ISBN 9780740793073. ^ a b "Dialogue With Doggie Daddy - News From ME". News From ME. 2004-03-24. Retrieved 2018-04-02. ^ a b Mansour, David (2011-06-01). From Abba to Zoom: A Pop Culture Encyclopedia of the Late 20th Century. Andrews McMeel Publishing. p. 16. ISBN 9780740793073. ^ a b Yowp (2018-01-28). "Yowp: Farewell to Doggie Daddy". Yowp. Retrieved 2018-04-02. ^ "Augie Doggie and Doggie Daddy (1959) - Intro". YouTube. Retrieved 2017-02-23. ^ "Doggie Daddy". Inyxception Enterprises Inc. Retrieved 2017-02-23. ^ "Augie Doggie and Doggie Daddy for Commodore 64 (1991)". MobyGames. 2014-11-02. Retrieved 2017-03-18. Augie Doggie and Doggie Daddy at Don Markstein's Toonopedia. Archived from the original on April 7, 2012.